Be the Beautiful Woman You Were Called to Be! We live in a day in which society has blurred the defining lines of ‘femininity’ and ‘womanhood.’ Meredith has wonderfully captured these concepts from a Biblical perspective and brought them into clear focus. This tool will help women everywhere to navigate through the treacherous waters of what our culture values and to reclaim their God-given call to radical, godly womanhood! Do you want to fulfill the call on your life as a virtuous woman in God's Kingdom? Do you want to be beautiful inside and out? To enjoy friendship, find a godly mate, celebrate marriage, and rule and reign in every season of life? Then, join us as we dig into Scripture to uncover timeless truths that will transform your life. Understanding why God created women in the first place will answer some of the questions you have about being a lady. After delving into the general question, let's get specific: Why has God created you? From there, we look at our relationship to God as our Father and His people as our family. This Bible study is get for young Christians and seasoned saints. It is a fresh call to embrace God's plan and purpose for you! Have you ever wondered what the big deal is about reading old books by dead people. You might be surprised to learn the role that classic literature plays in maintaining our political freedom. 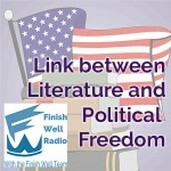 Listen to "The LInk Between Literature & Political Freedom" and find out why here. Each chapter covers truths that will transform your heart and life. Author: Meredith CurtisYou can purchase the print version of Lovely to Behold Bible Study at Amazon.